I wish I’d pointed out that Acts also has stories about folks being flogged and stoned and shipwrecked. Earlier in this series, I suggested that at some point we needed to take on the question of what growth looks like. If it isn’t swelling by attracting more of the existing religious “consumer base” than neighboring churches, then what is it? Is it true that the Holy Spirit isn’t at work in a church that isn't growing numerically? If you’re a small church in small town with a population that is static or shrinking, are you doomed to be a static or shrinking church? If you’re a medium-sized church in an urban area and you don’t look much like your surrounding community, are you destined for a slow decline into irrelevance? If you’re a church of limited resources that can’t compete with the big-budget Sunday morning productions of the church down the street, are you fated to be a haven for the last traditionalist holdouts in town? If growth is only a numbers game, then each of those churches is in a difficult position. Not only that, but the statistics for the church as a whole don’t paint a very rosy picture. They suggest that the rapid growth of some churches has more to do with the shifting of the existing religious “consumer base,” and that explosive growth in one church is offset by the losses in other churches — and may even represent the movement of large numbers of believers out of smaller churches and into a few large ones. Maybe part of the reason that some of us perceive that the church is dying is that we equate health with size. To be sure, there are troubling signs. But the fact of the matter is that America has been moving in the direction of becoming less churched and less monolithically Christian for a long time now. The numbers may never again look as impressive as they once did. So I suggest that it’s time we consider a different set of criteria for health, and acknowledge that churches can and should grow in all sorts of ways. One caveat: I’m not suggesting that the sharing of faith isn’t important. I’m not saying that we should lose our interest in seeing people follow Christ in the life of the Kingdom. But I want to say that small churches can be growing churches too, and that they contribute something to the body of Christ in the world — even if it isn’t butts in seats. So here’s how we might think differently about growth in the world in which we live. Churches can grow in ministry. One of the great things about a small church is the ability to adapt quickly. Large churches sometimes turn about as nimbly as a cruise ship with a busted rudder. With small churches, you can much more easily branch out into new works of service. Want to partner with a food bank to start a food pantry? Want to start a new Bible study in the neighborhood? Want to have a back-to-school child’s clothing drive, or set up a safe place for kids to get homework help or use the internet, or collect food and medications for a refugee camp? In a small church, you don’t usually have to go through two committees and three pastors. Think less about how many people show up on Sunday morning, and more about the number of people you serve, and you may begin to see that increasing the ways in which your congregation serves might be as important as increasing the number of people in the doors. Similarly, churches can grow by equipping each other for ministry. That’s what Paul seemed to think churches should be doing anyway. In a larger church with a huge staff, sometimes professionalism sets in. When you pay people to do certain tasks of ministry, the church can start to think that no one else can do it, or not nearly as well. In a smaller church, though, the need to equip one another for ministry is necessary. If the regular preacher is gone, someone has to fill in. Sharing the gospel is something everyone has to do. Taking care of the building, or putting together the visuals for worship, or visiting the sick — someone has to do all of that. Equipping becomes not as much a nice idea as something that’s necessary for survival. Churches can grow by multiplication. A few churches do this as a matter of course. Most don’t. With the emphasis on numerical growth, it may seem counterintuitive to imagine growth by shrinking. Try to imagine it, though, because if you’re a small church that isn’t growing where you are, then one of the things you might consider is planting a new church in another neighborhood. 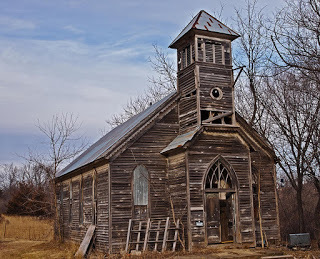 In fact, some statistics indicate that two smaller churches will grow numerically more rapidly than one larger one. At the very least, starting a new church in a nearby neighborhood — or on the other side of the world — increases the number of communities potentially impacted by your church. Churches can grow by sending. If you’re a church in an urban area, you especially know the frustration of having people move into the area, attend your church for a few years, and then leave with a job change or corporate move or whatever. I get that frustration. We need to consider, though, the influence those people will have for Christ in the new places where they live. When someone moves into your church, and you know the odds are good they’ll be there for 3 or 4 or 5 years at most, invest in them like they’re going to be there for life. Love them, help them find their place in the body of Christ, help them develop their gifts and strengthen their faith and grow to maturity in Christ. When they land somewhere else, then, they'll be ready to bless the church they become a part of and the community in which they live. Churches can grow in love. Love is the hallmark of the presence of God’s kingdom. If a church loves each other, and is willing to have that love stretched to include those outside its walls, it will become apparent that it is a community of Christ. If love isn’t evident, it doesn’t matter what they do. But love always takes discipline and effort. It requires us to be involved in each others’ lives, to have some knowledge of each other beyond our Sunday gatherings. In some ways, a small church is best suited to be a laboratory for the love of Christ. In short, your church can grow. If it isn’t numerically right now, then consider some other ways to grow. I think the Holy Spirit will be just fine with that.